A vital part of ICANN’s processes is the opportunity for there to be public comment on each substantial piece of work before it is put forward for final approval. However, the organisation has been criticised in the past for not flagging these public comment periods clearly enough, and it is fair to say that in many ways, the intended use of public comment forums has fallen into decline over time. It is not uncommon for there to be extremely few comments made in each forum, and for many of those comments to be unusable. To make matters worse, the useful comments that are supplied are given insufficient weight in ICANN’s processes, removing much of the value in writing a comment in the first place. ICANN plans to break this vicious circle and has taken several steps to encourage wider and greater use of the public comment within the organisation’s processes. This post will outline what they are and what future changes are in store. First, as a part of ICANN’s draft Management Operating Principles, the organisation has produced a Consultation Framework that outlines how it will approach consultation with the community. Within that framework is an effort to: post a summary of comments at the end of each comment period and in the same place as the comments; post an analysis of the comments; and request explicit reference and discussion of that summary by the relevant body while discussing the topic under consideration. It is hoped that these three (together with the others) will demonstrate to the wider community the clear value in posting comments during a public comment period. However, those changes in themselves will not make sufficient difference if people are unable to easily find out and review exactly what it is that ICANN has put out for public comment in the first place. All comment periods are official announced by ICANN on its main site (and you can sign up to an automated email service for ICANN announcements), and those announcements are then often pasted onto the many mailing lists that the community is signed up to. Nonetheless, it remains difficult for people to simply and easily find what it is that is currently up for discussion, and so we have produced a single webpage that will provide the community with that breakdown. It will be up shortly, but the first iteration of that page is posted below in order to provide you all with an opportunity to review the approach taken and suggest what improvements could be made. Please feel free to use this blog’s comment function as a way of supplying your suggestions and ideas. For your information: the next step in the making the public comment period more useful will be an effort to automate the process somewhat, thereby allowing individuals to receive personalised emails that cover the comment periods they are likely to be interested in (and important events within that comment period). This approach will take some serious development however and so in the meantime we would encourage everyone to increase their use of the comment period in order to make this development more worthwhile and hence a greater priority. Do please note that the page below will not be updated and so will rapidly become out of date. The continually updated comment page can be found at http://www.icann.org/public_comment/ and it is that page you should refer to if you are hoping to comment on a particular issue. This page provides a full rundown of what ICANN is currently seeking comment on, along with the dates of that comment period and a brief summary of what the topic in question is. An archive of recently closed public fora is provided under that; and finally a full list of comment fora. 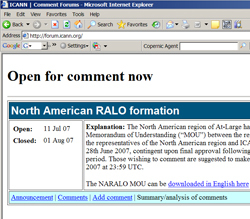 North American RALO formation (ends: 01 Aug 07) | .Name registry renewal agreement (ends: 29 Jul 07) | Draft Management Operating Principles (ends: 31 Aug 07) ICANN geographical regions report | Neustar new registry service | ICANN’s performance Click here for a full list of comment forums. .Name currently pays an annual fixed fee that has been subject to a maximum 10% annual increase since its inception. The proposed renewal agreement contains the same registry-level transaction fee schedule as the recently approved gTLD agreements. .Name makes a distinction between traditional second and third-level registrations vs. bulk third-level registrations. Bulk is defined as sales of 50,000 names or more under .Name’s consumer mass-market approach to third-level registrations. .Name has said their mass-market approach to third-level registrations is needed for the consumer market to prosper and grow. Bulk third-level registrations have a fee, as of the effective date of the agreement, roughly equivalent to 5% of revenue with: no minimum fee vs. second-level and traditional third-level registrations that have a fee minimum of $0.15US per registration: and a fee cap of $0.15US vs. other recently approved registry agreements that have a fee cap of $0.25US. This fee structure is intended to facilitate the sale of third-level names via a special program, a form of innovation, intended to provide new consumer choices. Explanation: As part of its commitment to continuously improving transparency and accountability, ICANN commenced a process of consultation with the community on the development of a set of Management Operating Principles.ICANN has a range of existing external legal and internal rule based accountabilities. Those accountabilities have never been outlined concisely and in collected form. For example, there has been no clear set of information disclosure principles, no clear participation framework, no clear translation framework and no organisational code of conduct. The draft principles and frameworks for accountability released on 23 June 2007 strive to achieve that purpose. They are presented in draft form for discussion and development with the community. You can read them here, or as a pdf file here. This is the first time that ICANN’s existing accountabilities have been collected in one place. Is this helpful? Was there anything presented that was unexpected or unknown? What more can be done to strengthen ICANN’s accountability? What more could be done to improve upon the existing processes for the Strategic and Operating plans and the budget? What more needs to be done to improve upon the draft translation framework? What more could be done to improve participation and the draft framework? Is the draft information disclosure policy suitable for ICANN’s needs? Is the draft code of conduct suitable for ICANN’s needs? Are the mechanisms for dispute resolution suitable for ICANN’s needs? Do the concerns as described in Section B of the report adequately represent the concerns? If not, please indicate what needs to change. Do you support the recommendations (Section D) of the Working Group?